I will start with the bad sock first. This should not happen. I made these for my mother and gave them to her about 2 years ago (with the big sock giveaway). The yarn is Socks that Rock (STR) lightweight, it was part of their sock club that I was a member of. It makes me sick to think of all the time that I put into knitting with their yarn, and it does not hold up. My mom is in her 80’s and only uses these as house socks. 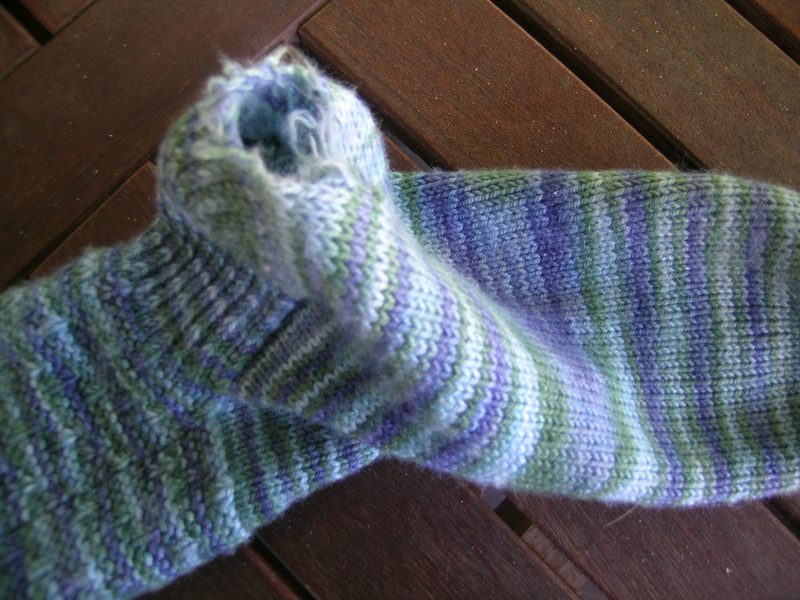 In contrast, she also gave me a different pair that I think I made her about 10 years ago with Lang Jawoll sock yarn, and those have only minor wear holes in them. And now the good sock. 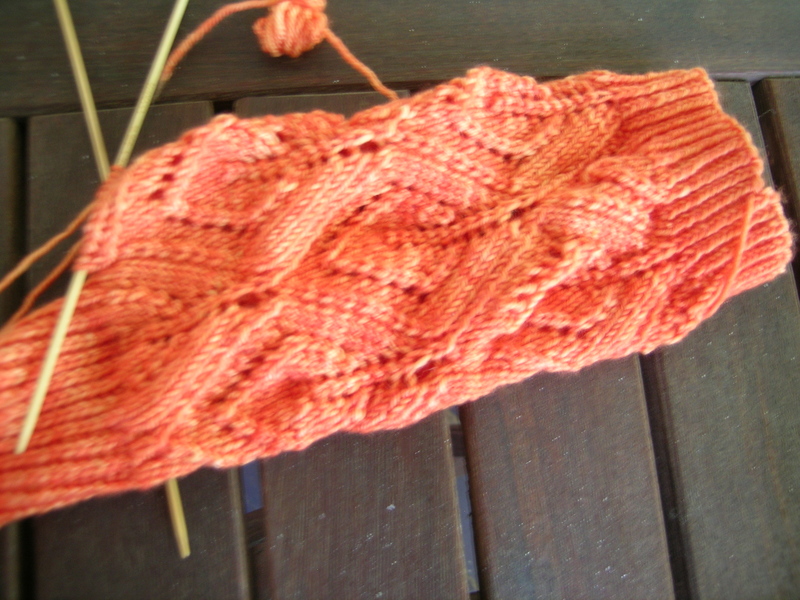 My current sock knitting is the Orange Pekoe from the CookieA sock club. The yarn is Hazel Knits, and it is knitting up very nicely. I couldn’t agree with you more about STR. I have a basket full of socks waiting for holes to be repaired and every pair is STR yarn. There must be about 6 pairs with holes. I have decided that since I like a lot of the colorways and I already have them in my stash that they will only be used for scarfs, shawls and maybe mittens. The STR is not sock worthy, sorry BMFA. I am now only knitting socks that have 20 to 25% nylon. Sometimes less if it is Bugga or Skinny Bugga. I’m sorry your mom’s sock fell apart. I wish you luck in darning them. But your right. I actually just trashed both pairs of socks. The other ones didn’t bother me as much, since they were much older. No more STR in my stash, and none will enter. I went through a phase that I was in the Rockin’ Sock Club and I was buying a lot of STR. After the holes in my socks I sold 27 skeins. I still have 18 skeins and I plan to use it for weaving where not much stress will be on it as a scarf. But to sell 27 skeins of some colors I really liked tells you how mad I was of the wearability of this yarn. I was also upset that the vibrant colors faded after the first or second wash. I have other yarn that doesn’t fade and is better wearing. I rather spend money on that kind of sock yarn. There are a lot of very beautiful yarns with nylon. Also I am spinning a lot so maybe I will just spin my own yarn. I don’t blame you for trashing your socks and not using STR anymore.